We delve into horror with Stewart Horn who read his story about a zombie invasion with a difference. We talk about why we love horror, why horror for children is important, how it has changed over time to embrace the complexities of modern life, and how it can help you as an LGBT+ person. We propose a recipe for hummus (Scottish style), plus a bonus poem, and a lot of humorous chat. And why Neil Gaiman and Charlie Brooker might want a word with us. Not to mention Werewolf vs Shark, round 4! Content Advisory: Horror! Gore! Adult themes! Naughty words! Ooh. Stewart Horn is a professional musician and amateur writer, poet, photographer and filmmaker. Originally from Glasgow, he now lives with his husband and assorted pets in the quaint seaside town of Troon. 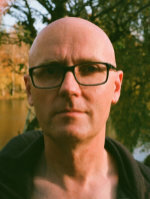 His short fiction and poetry have been published in books, magazines, journals and websites in the UK, North America and Australia, including Crowded, Lovecraft Ezine, The Horrorzine, Feast of Frights, Estronomicon, Interzone, The British Fantasy Society Journal,and Thirty Years of Rain. His work has appeared in podcasts Pseudopod and Tales to Terrify. In 2016 he wrote and directed the short film Baby Good, with a community group in his hometown. In 2017 he won the James White Award for short fiction. He is a member of the renowned Glasgow Science Fiction Writers’ Circle, writes reviews for the British Fantasy Society and Ginger Nuts of Horror, and blogs intermittently at stewartguitar.wordpress.com. You can find his fantastical themed gay erotica work on Excessica.com or Amazon. This episode is sponsored by Judgement by Fergus Bannon. Described as “the X-Files meets 2001: A Space Odyssey”, this fast-paced action book will bend your mind sideways as it moves from the everyday to the incredible. 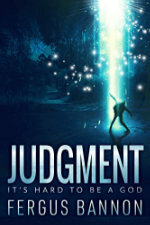 Find Judgement by Fergus Bannon on Amazon. The Adventure Tree by Enid Blyton (which is actually The Faraway Tree). How many English civil wars have there been? The Terminator Series and model numbers!